The Oregon economic numbers show that Oregon’s tepid growth is being led by temporary employees. Temp employees along with the rise of part-time employees reflecting of the changing face of employment as the nation as a whole. 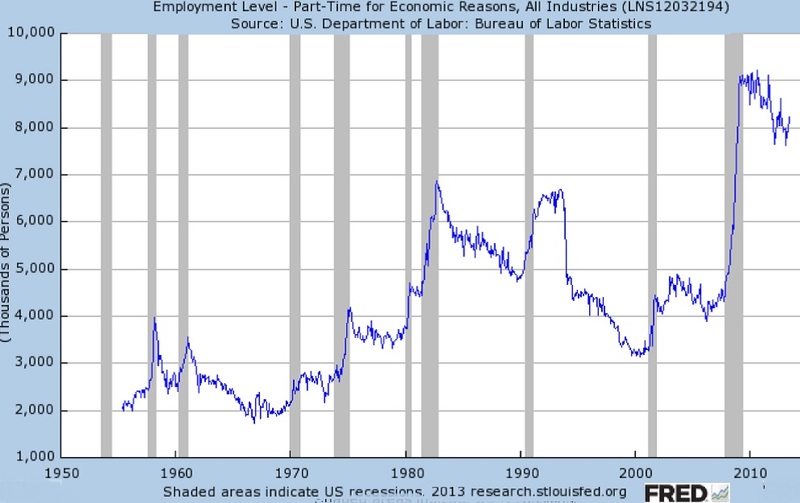 Today one in ten American non-farm workers (28 million) are “temporary” employees, close to an all-time high. The second largest employer in the United States Is Kelly Services, a temp agency. The most recent Labor department jobs report showed that while total nonfarm payroll employment increased by 162,000 in July, those increases were primarily in retail trade, food services and drinking places, and many were part time positions. (see part-time growth chart nearby). That could be a sign that some employers are hiring part time workers to avoid the ACA’s requirement that companies with over 50 full-time employees provide health coverage to full-time staff. The Affordable Care Act stands to give temp agencies an even larger share of the employment market. The reelection of President Obama assured the act’s implementation, and sent temp agency stocks soaring. Each business will react to the Affordable Care Act in the way that is least destructive to its bottom line. For many employees, that will mean part-time or temporary employment. Because the Affordable Care Act applies to businesses with over 50 employees, businesses with fewer than 50 employees will use temporary or part-time workers to stay under 50 full time employees. Additionally, because small businesses don’t have whole departments devoted to benefits and regulation compliance the way big businesses do, some employers may simply throw up their hands and turn to temp agencies to avoid the paperwork. Some may even lay off existing full time employees to do so. A number of restaurants and other low-wage employers say they are increasing their staffs by hiring more part-time workers to reduce reliance on full-timers before the health-care law takes effect. CKE Restaurants Inc., owner of the Carl’s Jr. and Hardee’s hamburger chains, last year began hiring part-time workers to replace full-time employees who left and as a result has boosted its overall workforce. Darden Restaurants, Inc., the parent company of Olive Garden and Red Lobster, is hiring a greater percentage of part-time workers at its new stores to reduce the costs of complying with the ACA. The popular teen fashion retailer, Forever 21, is conducting a massive move their full-time employees into part-time slots according to leaked memos to the media. Once upon a time temporary staffing agencies were used by employers to fill temporary employee absences or to provide additional staff for short term projects that exceeded an employer’s current capacity. In the 1990s, employers figured out that using temp agencies as a source for regular workers gave them a way around increasingly burdensome employment regulations, and provided a degree of insulation from potential employment related lawsuits. As employers know, the paperwork associated with even one employee can be formidable. Employment laws are confusing at best, and compliance can be difficult. In many cities and states, it is incredibly difficult to fire an employee without becoming a target for civil penalties or a lawsuit. The beauty of temporary employees, from a business standpoint, is that they work for the temp agency. The temp agency handles all the regulatory paperwork. If a business wants to “fire” a worker provided by a temp agency, they just call the temp agency and the worker is gone, with no exposure for the business. The downside for workers is that money that might have gone to their wages and benefits now goes to the temp agency. Fees can be as high as an employee’s wages. Some companies use temp agencies as a way to screen potential employees prior to hire, but, increasingly, temporary employees stay temporary employees. With unemployment high, even high quality workers lack the leverage to move from temporary to regular employment. The 40 hour worker is disappearing.